For clients in retirement, we look at their projected lifetime spending needs and current account balances to back into a portfolio that has been historically sustainable. By approaching the composition of the portfolio with this liability-driven approach, we seek to better balance the risk and return profile in the context of the clients future financial goals. In the example below, we found that the client would be best served by an income portfolio that was able to fund the first 8 years of their spending needs. As the markets rise and fall and the client has unexpected windfalls and expenses, we can adjust the portfolio so that the client continues to understand where they stand and what we will do to try and provide the most historically sustainable portfolio possible. 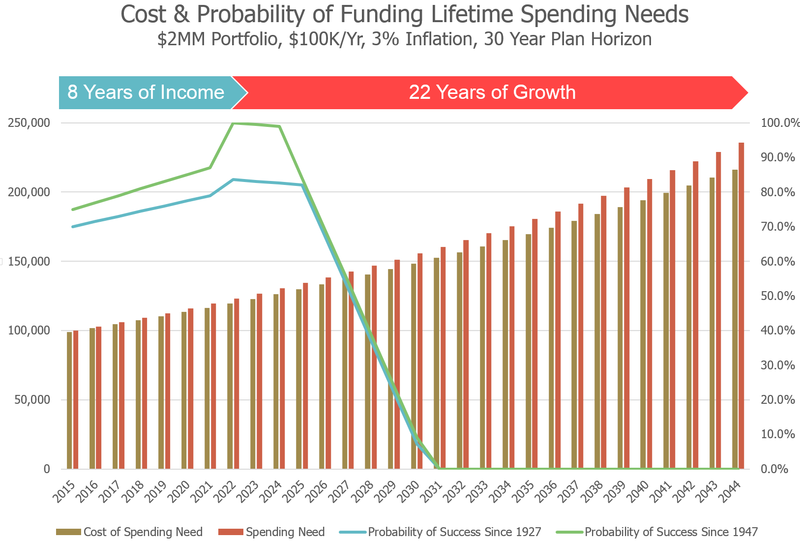 For clients nearing retirement, we look at their projected lifetime spending needs and current account balances to find out how many years of retirement income they should purchase initially and how much they should contribute in remaining years leading up to retirement so that they have a portfolio that has been historically sustainable. By approaching the composition of the portfolio with this liability-driven approach, we seek to better balance the risk and return profile in the context of the clients future financial goals. In the example below, we found that the client would be best served by an income portfolio that was able to fund the first 8 years of their spending needs. 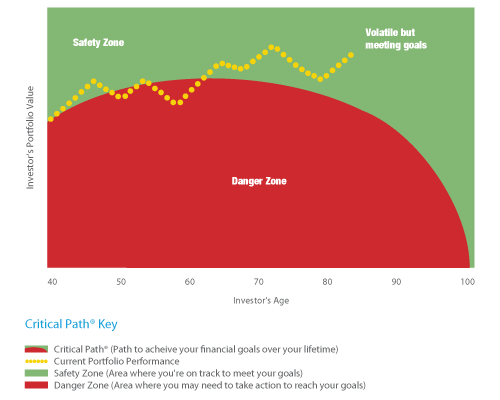 For clients in the accumulation stage, we first seek to better balance the risk and return profile of the goals with shorter time-horizons (ex. college) and then invest the remainder in combinations of asset classes that have historically maximized minimum and average returns over longer time horizons. If a client is weary of having a larger allocation to equities, we can invest the principal that the investor wants to protect in investment grade securities that are at advantageous points along the yield curve. Doing so, they can earn a higher return than cash and better protect their investments from rising interest rates than if they invested in bond funds.